It all starts with a good bag. My favorite is the Maggie b weekender. It folds up tiny when not in use and expands to a size that easily accommodates my, my husbands, and my two kiddos stuff that I inevitability will be carrying. Having a skin cancer scare has made me become so much more careful of the sun's rays. 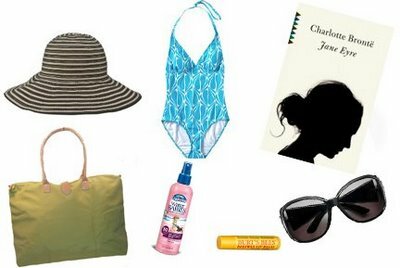 So now you will always find me with a lip balm with SPF, strong sunscreen, big sunglasses, and a hat. All must have's for extra protection. I also love a sunscreen as a spray, so much easier with two kiddos that are ready to play. Of course a swimsuit that makes me feel good is a must. Believe it or not, but my favorite suit comes from Old Navy. Finally, getting to read a good book while lounging around while hubby and kiddos make sand castles could not make me any happier.